Moonlight Moose Money Clip Bronze or Sterling Silver by Hennessey Jewelry at Nicky's Blog. Hurry! Limited time offer. Offer valid only while supplies last. A moose wanders in the light of a crescent moon. 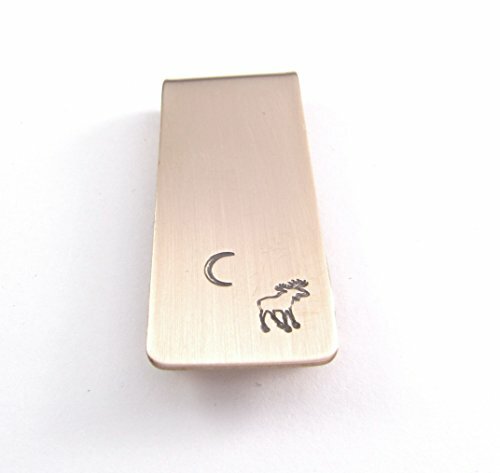 This is a handmade sterling silver or bronze (shown) money clip stamped with a moose under a moon. A moose wanders in the light of a crescent moon. This is a handmade sterling silver or bronze (shown) money clip stamped with a moose under a moon. The imprint is oxidized to highlight the details. Brushed finish. Your money clip is hand cut, stamped, oxidized, shaped, and finished. It's made with sturdy 20 gauge metal so it holds it's spring and shape. The money clip shown is the "narrow" style" which is 2 inches long and 3/4 inches wide. You can also order the "wide" style which is 1-1/2 inches long and 1 inch wide. Your money clip is made to order. Please allow up to two weeks for your clip to be made. You may contact me for current shipping times. View More In Money Clips. If you have any questions about this product by Hennessey Jewelry, contact us by completing and submitting the form below. If you are looking for a specif part number, please include it with your message.